Huckabee Sanders Rants At "Outrageous" Reporter, Suggests Everybody Watch James O'Keefe's Video - Joe.My.God. Sanders began with a question from Breitbart’s Charlie Spiering, who asked if Donald Trump went on a tweetstorm against CNN this morning because the network’s retraction wasn’t good enough to satisfy the president. 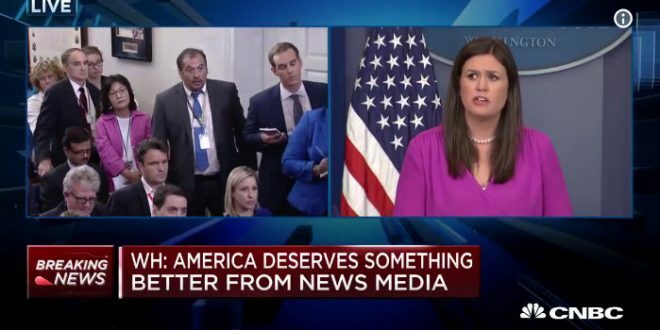 Sanders responded that Trump is frustrated by the “constant barrage of fake news,” and she suggested that people should watch the new video from Project Veritas where a CNN producer objects to his network’s coverage of the Trump/Russia investigations. After she accused the media of nitpicking small mistakes by the White House without holding themselves to the same standard, Brian Karem with The Sentinel newspapers in Maryland interrupted her response. “You are inflaming everyone right here right now with those words. This administration has done that as well….Any one of us are replaceable, if we don’t get it right, the audience has the opportunity to turn the channel or not read us. You have been elected to serve for four years at least, there is no option other than that,” he said.